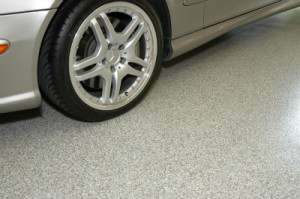 Probably the most popular inquiry we receive is, what is the best garage flooring? As simple as that question may seem, it’s not really one that is answered easily. It’s kind of like asking who makes the best car. It can depend on how much it costs, how it looks, and what you want to use it for. Assuming that we want the most durable, good looking, and longest lasting floor, we came up with three different options that you could choose from. 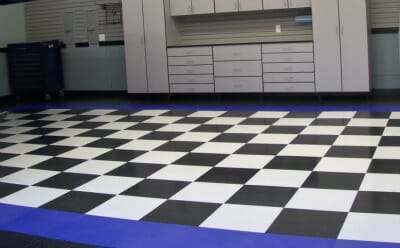 So let’s discuss what makes these choices the best flooring options that you could choose for your garage and why. In terms of durability, protection, and cost compared to the duration of the floor, a professionally installed multi-coat resinous system has to be one the finest garage floors that can be installed in a home. This type of coating will usually consist of a combination of 100% solids epoxy, polyurethane, or polyurea/polyaspartic coatings. This type of flooring is the most widely used in warehouses, restaurants, manufacturing plants, professional mechanics garages, and showrooms and has been for years. The finish is actually 3 – 10x stronger than the finish of the concrete itself depending on which combination of coating you choose and most manufacturers offer a lifetime warranty on the product. Garage floor coatings such as these are almost stain proof, they are water resistant, resistant to road salts, highly chemical resistant and resistant to chips from dropped objects. They are also extremely easy to clean and look great. There are more color choices, custom paint chip colors, and different aggregate to mix into the floor than there ever has been. If you have a very active garage and demand the toughest professional flooring that can be installed without worries, then this would be your first option to consider. As great as a quality garage floor coating is, it does have some drawbacks to consider however. If your concrete floor is extremely stained or needs extensive crack repair, it may be cost prohibitive to install. A floor coating such as this does not do well if you have moisture issues. Hydrostatic pressure from the moisture can actually cause the coating to peel up, sometimes taking pieces of the concrete with it. It also needs to be professionally installed in most cases and can run from $4 – $8 a square foot depending on the system. You can install a garage floor coating yourself however if you want to save some money. If you still want a tough and good looking floor but want something easy to install yourself in order to save money, then interlocking garage floor tiles would be a great choice in terms of the best flooring for your garage. They are also an excellent choice if you have the previously stated issues relating to your slab. These polypropylene tiles are extremely tough, resistant to stains, easy to clean, and come in a multitude of cool colors to truly custom design a beautiful looking garage floor. Some companies have warranties of 10 years or more on the tiles and they are easy to install. 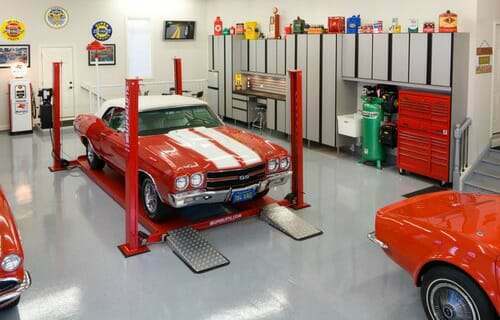 A typical 2-car garage can be completed in just a few hours. One of the features that makes this type of flooring unique is the hollow core underside. If you have moisture issues with your garage floor, this tile allows for air drying underneath which avoids mold and mildew problems. It also makes for good drainage when pulling in a wet car from the snow or rain and can be a great buffer to cold concrete underneath. It can provide for some anti-fatigue properties as well. 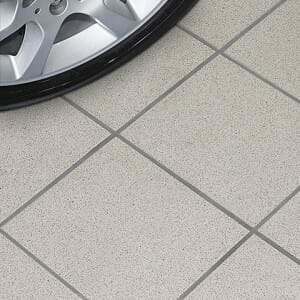 Interlocking tiles can easily span cracks in the concrete and follow the contours of the floor. Rolling tool boxes, jacks, and jack stands are not an issue and at $2 – $5 a square foot for most tile, they are more economical than a professionally installed floor coating. Some common complaints with this type of flooring is the click clack noise they can sometimes make when walking on them and the lack of sound absorption in a somewhat empty garage. They also tend to show dusty footprints when dirty and the less expensive brands can be harder to keep clean. If you don’t have moisture issues with your garage, then an honorable mention needs to go to a porcelain tiled garage floor. Believe it or not, this type of flooring is luxurious, extremely durable and has been gaining in popularity over the years. Many people who have used porcelain tile would argue that it’s the best garage flooring you could install. It is highly resistant to stains, chemicals, impacts, road salts, and water. Manufacturing plants, mechanics garages, and drive through porticos are just some of the examples of porcelain tile being used. One of the disadvantages to porcelain tile is that some choices can be somewhat slippery when wet and the grout between tiles can become dirty if not properly kept up with sealing. Another little known fact is that good quality porcelain tile can be purchased on sale for under $1 a square foot if you look around. It can be installed by a contractor for $2 – $4 a square foot plus supplies depending on your area. If you know how to lay tile, it can be one of the most economical options and still be one of the most durable of floors. This is why porcelain tile receives an honorable mention for the best garage flooring to install in your home. We could easily include the cheapest or easiest to install as choices as well, but we feel that it defeats the purpose of the question for the best flooring. Another factor to consider is aesthetics. It may be a great floor, but if you don’t like the looks, then it obviously is not for you. So depending on your preferences and needs, any one of these three choices would easily qualify as the best garage flooring that you could install for your home. My husband and I had a local epoxy company do our garage and we love it. It wasn’t the cheapest flooring, but I’m so happy with the way it looks. And since I’m the one who has to clean the mess on the garage floor from the muddy bike tracks and boot prints from the kids, it’s made it so much easier to do. Intend to install an insulated floor on top of the concrete slab in my workshop/ garage. Intend to use 3/4″ t&g plywood for the flooring material. Can 2 part epoxy finishes be applied to the plywood to provide a water resistant and tough surface that will stand up well to the rigors of shop life? If so, any suggestions as to best products or techniques? Thanks. Hello Ken. Yes, epoxy can be applied to wood as long as the flooring doesn’t flex much at all. Epoxy coatings are extremely hard and can crack if the wood flexes. The wood needs to be clean and lightly sanded with 40 – 60 grit sandpaper and an epoxy primer is required as the first coat. Once the wood is prepped, application is the same as concrete. Some companies such as Legacy Industrial offer a flexible bridging primer that works well with wood. It tends to fill gaps better which you may have with the T&G plywood. They are a good source for epoxy on wood floors and have good customer service. Armor Garage is another source for epoxy on wood floors. For wood, do not go with the inexpensive epoxy products or you will be redoing your floor in a few years. I will be running ductwork – the AC load checks out. I will be insulating the walls and attic and the door. I’m wondering about what to do about garage floor coverings. I am grinding and prepping the garage floor. Ideally, I’d like to seal the floor and then put down interlocking tiles. My biggest concern here is keeping it cool in there. I’d like to keep costs at a minimum so the expensive 3-part epoxy systems are out- especially considering there will be no vehicles inside. What are my best and cheapest options here? Hello Drew. We are assuming you are asking about a sealer? If you are not going to apply a coating and you want to seal the concrete after grinding, then we recommend a siliconate sealer. This will seal up the concrete and resist staining until your budget allows for interlocking tiles. Thanks Shea. I am wanting to seal first and then put down interlocking tile (possibly insulated) for a more comfortable walking surface. Since this will be a converted game room with AC, i’m wondering what type and brand of sealer to use. From what I know about siliconate sealers from this lovely website is that they allow the concrete to breathe. Isn’ that the opposite of what I want for my application? Since the rest of the garage will be insulated, I’m concerned with hot air breathing in through the slab from outside thereby making it more difficult to cool the garage. Can you recommend a sealer or low coast coating that’ll work here? Penetrating sealers breathe Drew as do some film forming sealers such as acrylics. Concrete slabs are like a large sponge and can absorb liquid water from various directions, both above and below the slab. Most penetrating sealers (with some exceptions) stop liquid water from both directions from traveling through the barrier in which the sealers are active, but they do allow the water vapor to pass. This prevents efflorescence from forming, it prevents a wet concrete surface if the moisture is coming from below, and prevents water vapor from freezing. Freezing water vapor can cause spalling and pitting. Coating such as epoxy for example, stop both moisture and the water vapor from escaping. This can cause efflorescence to build up under the coating and or hydrostatic pressure, both of which can cause a coating to fail. This is why a moisture test should be performed before applying a non-breathable coating to a garage floor. Sealers and coatings do not act as thermal barriers and have no effect on cooling or heating. For your purposes, a siliconate sealer or a deep penetrating silicate sealer will work just fine. Hi Ken. My garage floor is plain concrete. I want a tough floor covering being that I want to restore classic cars, moving floor jacks, jack stands and engine lifts around. I’ve thought about the interlocking floor tiles, but don’t now how they would stand up to all the pressure from jacks and all that goes along with restoring old cars, the same with all the epoxy and other paint style coverings. In your opinion which style would be the best type for a working garage, and not just a place to park a car. Hello Jeff. A premium interlocking tile brand, such as RaceDeck or SwissTrax for example, will hold up very well for what you want to do. There are some conditions you would have to follow, however. Unless you are jacking up a lighter vehicle with a jack that has wide wheels, it’s best to have a piece of 3/8″ plywood or an extra tile to slide under jack wheels when lifting a vehicle. Heavy cars can cause the wheels to leave a mark. Jack stands are fine as long as they have a flat base. We use Esco jack stands all the time on heavy vehicles and they work great on the tiles. Sliding jacks around, engine hoists, rolling tool boxes, creepers and etc do just fine on them. A solid top tile would be our recommendation. These type of tiles are very hard to stain and clean up easy. A multi-coat, high solids epoxy floor system would perform the best out of the two choices. We would recommend a primer coat, colored base coat, and a high performance clear top coat of polyurethane or polyurea. Colored flakes are optional. A full colored flake epoxy floor actually provides thickness to the floor as well as impact resistance, but it can make finding small parts that drop on the floor fun to find sometimes. You can use what ever jacks, lifts, or jack stands you like. If you install such a floor yourself it will require more work than interlocking tiles, but it will cost less. We recommend contacting a good concrete floor coating vendor to discuss options and how you plan to use your floor. Stay away from the home improvement center epoxy kits as they are designed for residential use only and will not stand up well to what you want to use your garage for. Hello Jack. If you are getting a full color flake floor, then sometimes two coats is the better way to go. If you are getting less than a full color flake floor, then one coat is fine. It really depends on the dry film thickness of the polyurea when a full color flake application is the goal. If it’s less than 4 mils, then two coats would be the preferred way to go. The reason is that all the irregularities at the surface of a full color flake floor is going to absorb a lot of the first coat. If the polyurea is greater than 4 mils thick, then one would work fine. We have no idea what they mean by a polymer coating as there is no such thing. We have found that sometimes some flooring companies create their own buzz words for marketing purposes. A hybrid flooring is generally an epoxy base coat with a polyurethane or polyurea top coat. We suggest reading our article about how to choose a floor coating contractor here. One important thing to do is ask to see the technical data sheets of the product they will be using. This will give you a better idea of the performance of the products they use. What about in door out door carpet over cement and and two ft up the walls. Me and my cars have enjoyed this concept. Sure, there is carpet you could use for that, Jim. Just make sure to use the proper type. We have an article about carpet for a garage here.